Oh Christmas Tree, Oh Christmas Tree! The Christmas tree is an important part of the Christmas tradition in many Christian families. Many of our Christmas memories comes down to remembering opening gifts around the Christmas tree or decorating the Christmas tree with your siblings and your parents. The crafts on this page are representations of Xmas trees, such as paper-folded, felt, beaded, or even Christmas trees made from recycled magazines. Find inspiration for your Christmas tree crafts below. These may be made from construction paper or silver or gold gift paper. First make a pattern for the tree and trace it on cardboard. It may be similar to the one suggested in Figure a or it might be a plain triangle type. Trace just half of the design on a piece of cardboard and cut it out. Fold the construction paper in half. Lay your cardboard pattern on the fold and trace around it. Make three of these and cut them out. The finished tree shown is made of three' cutout trees put together with clear tape. Join the sections with clear tape. Take two of the trees, folded in half, and lay them down flat, the folds touching, and join them from top to bottom with a piece of clear tape. Add the third tree in the same manner, and tape it to the first one. The finished tree is six-sided, stands up easily, and makes an attractive decoration for mantel or window sill at home or in the schoolroom. A cool way to decorate these trees is with colored cellophane tape. This comes in bright solid colors and in a variety of attractive Christmas designs. Apply strips of tape across the cutout trees, as shown in Figure b. Or decorate with sticker stars. These trees can be any size. The larger ones-6 to 8 inches high —make good mantelpiece decorations, while trees 3 inches high make perfect homemade decorations for your Christmas tree. There are many combinations of paper and tape with which to work. You will need the following...Several pieces of colored construction paper, compass (or just free hand draw the circles), scissors, 1/8" doweling, block of wood (or clay or play doh) for stand, Scotch tape, and a pencil. Cut about 14 circles of graduating size from construction paper. Snip around outside edge of circles. Push dowel through center of graduated circles with smallest one at the top. Space circles evenly along dowel and fasten with Scotch tape. If using clay, just stick the tree dowel in the clay for stand. If using, wood, ask parents to help to make a hole in the block for the tree stand. Star may be added at the top. These decorative little trees can be used most effectively on holiday and birthday tables. They can be as simple or as ornate as you like. Cut the tips off several cone-shaped drinking cups with a pair of scissors, as in illustration A. Either decorate the cones with paint or crayon designs, or paint the cones a solid color. After they are dry, glue fancy stickers, seals, stars, magazine, clipart, or Internet cut-outs or crepe paper or ribbon bows onto them, as in illustration B. 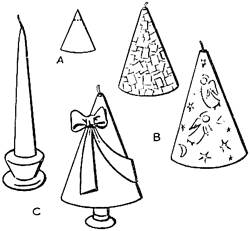 Place the cones over candles in candlestick holders, as in illustration C.
There are 2 ways that you can make these paper stand-up trees. 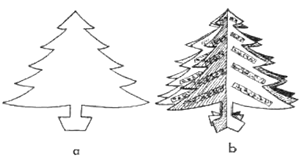 Both of these crafts include cutting out a Christmas tree like you see in illustration #3. But you can make the Christmas stand in two different ways. 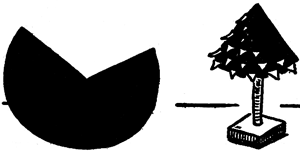 The first way is show in illustration #1 and # 2. In this way, you cut out a rectangle...fold it in half, and then cut a small slit in the center. You then place the tree in the center and you have created a stand-up tree. The 2nd way to make the stand is to fold 3 smaller rectangle pieces of paper. You then glue them together as you see in the bottom left of the illustrations above. You then push the tree into the space that is created in the center. These are a great addition to any Christmas paper craft. You can also decorate them with tiny paper decorations. A conical tree, ornamented with cellophane, augments the room's warmth at Christmas time. Make a cone of heavy green construction paper and glue it to keep it in shape. Fill a small box filled with sand and project into it a straight twig / stick from outside, a dowel. a chopstick, or a like shaped object in an upright position. Wrap the box and the tree trunk with decorative paper or paint it. Glue the cone down over the rod. Get some cellophane, colorful wrapping paper, tin foil, or other colorful / shiny material. Then cut triangles or circles and glue rows of them, beginning the rows at the bottom and overlapping each row over the preceding one. Here is a great way to make quick decorations for Christmas. Fold a piece of paper (if you have card stock or stiff paper, this works best) in half. Draw and then cut around a simple Christmas Tree pattern (draw only one half of it) ...while the piece of paper is still folded in half. Now open up the folded piece of paper and you can see a cut-out Christmas Tree. Now you can use this cut-out as a stencil...hold it down tight, and use a crayon, colored pencil, paint, etc. to make Christmas Trees all over wrapping paper, cards, Xmas decorations...have fun. Easy to Make Advent Calenders Christmas Crafts for Kids – Part 1 - Advent calenders are always lots of fun. But most of them take ages to make. Here’s a simple version of the advent calender that will take you a couple of hours to make- at the most. So sit down one afternoon with your kids and make this simple advent calender. Part ! of the instructions are given below. In this page you can learn to make the gifts. Easy to Make Advent Calendars Christmas Crafts for Kids - Part 2. Fanned Out Magazine Christmas Tree - Upcycle a magazine into a beautiful, standing Christmas Tree Decoration. How to Make Pop-Up Chrstmas Tree Cards - Find out how to make these pop-up Xmas Tree Cards. 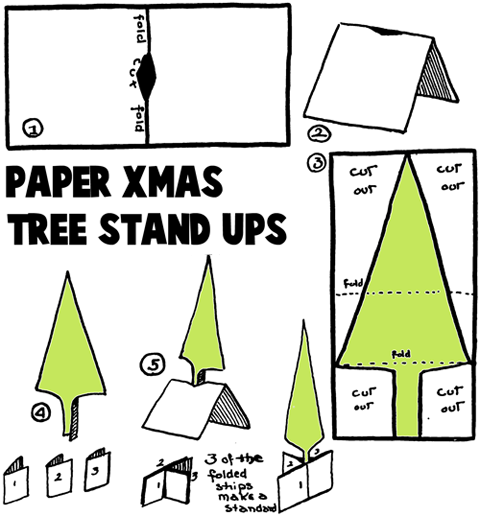 Making and Folding a Paper Christmas Tree - Find out how to make a paper model Xmas tree. Make a Mini Christmas Tree Arts & Crafts Project & Activity for Kids - Christmas is coming up soon so it is time to start decorating the house with your arts and crafts projects and activities. This mini Christmas tree will look great on your window sill, or on the table this Christmas. All you need is some paper, scissors and glue. So get started right now- the instructions follow. Gold beads Christmas Tree Card Crafts Project for Kids - Here’s a pretty handmade bead card that your children’s friends and family will be very impressed to see. Make sure you get the right kind of beads- flat on one side and rounded on the other. The simple instructions to make this Christmas card are given. Learn How to Fold Origami Christmas Trees - Learn how to fold up your own origami christmas trees with the following instructions. Pony Bead Christmas Tree Ornaments - Learn the pattern for making these pony bead Xmas trees...then hang it on your real tree. Bottle Brush Christmas Trees - These turn out adorable...they look like real mini-Xmas trees. Find out how to make theme here. Unique 3D Christmas Tree Cards - Make these standing Chrsitmas Trees...that also are Xmas cards. Cotton Swab Miniature Christmas Tree Ornament - Use a clear glass Christmas Ornament and a Cotton Swab to make a Xmas Tree ornament. Wooden Christmas Trees - Here is a christmas tree to make in wood shop or with one of your parents. Baby Food Jar Christmas Tree Making Project - Make a beautiful Christmas tree out of 33 baby food jars with lids. Bath Time Christmas Tree - Decorate your bathroom with a fun foam Christmas tree. Beaded Christmas Tree Making Instructions - To make a Christmas tree beaded safety pin jewelry, follow the free pattern given. Christmas Tree Craft to Make - Find out how you can make a classic looking Christmas tree centerpiece decoration. 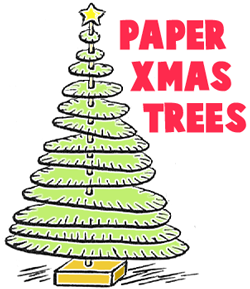 Christmas Paper Tree to Make - Kids can easily make a Christmas tree out of green construction paper, crayons etc. Christmas Tree Paper Ornament Directions - Kids can craft this ornament to decorate the family Christmas tree. Christmas Wish Tree Crafts Project - This Christmas wish tree is a cute craft for the children to do during the Christmas holiday. Clay Pot Christmas Tree Crafts Activity - Make a Christmas tree out of a clay pot, green acrylic paint, styrofoam ball and other simple materials. Dazzling Christmas Tree Crafts Project for Kids - This dazzling Christmas tree is simple and fun for children of all ages to make. Drinking Straw Christmas Tree Activities - Recycle 25 plastic straws to make an amazing drinking straw Christmas tree centerpiece. Christmas Tree Light Pull - This Christmas tree light pull craft is a perfect craft to do with your kids. Christmas Tree Cones - A fun Christmas tree treat for kids to make and also enjoy eating. Crimped Paper Tree - Use simple craft materials to make a beautiful crimped paper tree craft. Christmas Tree Fan - This is a simple and fun Christmas tree craft for children of all ages. Coat Hanger Christmas Tree Projects - Recycle old wire coat hangers to make a Christmas tree centerpiece decoration. Candy Tree - Make these cute candy trees for your friends and family. Christmas Tree Handprint Craft - Your kids can make a cool Christmas tree decoration using their handprints. Christmas Tree Craft Projects- Learn how to make Christmas tree using paper, glue, scissors and something to color with. Christmas Lacing Projects Projects - Make a Christmas lacing stocking with your children in preschool and kindergarten. Christmas Tree Ornaments - This tutorial will show you how kids can easily make Christmas tree ornaments to hang on their tree. Cotton Ball Christmas Tree - Learn how these beautiful Christmas trees can be made by very young children. Christmas Tree Centerpiece - Find out how to make a Christmas tree centerpiece out of glitter, glue, markers, paper pads, scissors and model magic. Christmas Tree Garland - All you need to make a Christmas tree garland is glitter, crayon, glue, paper pads and scissors. Christmas Tree Table Topper - Decorate a boring table over the Christmas holidays with this Christmas tree table topper. Christmas Tree Box - Send someone a Christmas gift in this wonderful and festive Christmas tree gift box. Christmas Triangle Trimming - This Christmas triangle trimming craft is a fun Christmas craft for kids of all ages. Christmas Bow Tree - Learn how to make a beautiful Christmas tree centerpiece using stick-on Christmas bows. Christmas Trees - With this craft, young children can decorate their own little Christmas tree. Dimensional Christmas Tree - This is a fun craft where kids can make a 3-Dimensional Christmas tree decoration. Felt Cone Christmas Tree - Follow these instructions on how to make a felt cone Christmas tree with your children. Foam Tree - To make a foam Christmas tree, all you need is a green fun foam, cardboard, pen, scissors, glue, glitter (red, gold, green and silver), glitter glue pen and a hole punch. Felt Christmas Tree - This is the ultimate Christmas craft for both children and adults. Felt & Button Christmas Tree - Kids can learn how to sew while making a festive felt and button Christmas tree. Fruit Loop Christmas Tree - A fun Christmas tree craft using colorful fruit loops and green construction paper. Handprint Christmas Tree - Display your family and close friends on this customized handprint Christmas tree. Handprint Tree - This Christmas tree is simple but fun to make. All you need is your handprint, construction paper and simple craft materials. Light Up White Christmas Tree - Turn your home into a winter wonderland with the help of this beautiful white Christmas tree. Mini Styrofoam Christmas Tree - This is a simple Christmas tree craft made out of a small styrofoam cone and glitter. Miniature Pinecone Christmas Tree - Learn how to make a cute miniature Christmas tree out of a pinecone. Mini Pine Cone Christmas Trees Projects - Find out how to make a tiny Christmas tree for your bedroom desk. Multicolored Christmas Tree - Use Crayola products to make a unique Christmas tree decoration. Paperback Christmas Tree Projects - This Christmas tree is very easy and also fun to make from an old paperback book. Pine Cone Tree Projects - Turn a Styrofoam cone into a beautiful Christmas tree in a few steps. Paper Cone Christmas Tree - This is a simple Christmas tree craft for children ages 7 and up. Paper Christmas Tree - Follow these instructions to make an amazing Christmas tree using green construction paper and a few more materials. Pine Cone Tree - Turn a pine cone into a cute Christmas tree. Paper Christmas Tree - Learn how to make a miniature Christmas trees using a cardboard toilet paper roll, construction paper, etc. Sun Catchers Christmas Tree - Follow these instructions carefully to make a sun catcher Christmas tree to put by your window. Safety Pin Tree - Make a Christmas tree using safety pins and pony beads! Sticker Christmas Tree - Your kids will enjoy making a simple Christmas tree out of green card and stickers. Terrific Top Christmas Trees - This small Christmas tree craft is fun for children of all ages. Terrific Textual Christmas Tree - Learn how to make a Christmas tree from egg cartons by following these instructions. Twiggy Christmas Trees in July - These Xmas trees are made with gatthered up twigs and sticks...a fun craft to do in July that can be hung up any time of year.